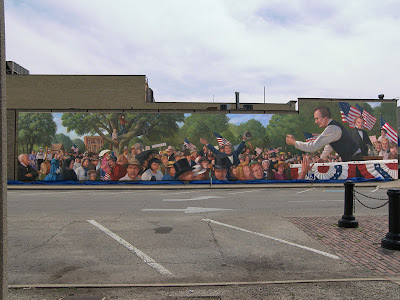 Jared and I have returned back to the future, having spent all last month in the year 1858 while painting the Lincoln/Douglas debate mural in Ottawa, Illinois. 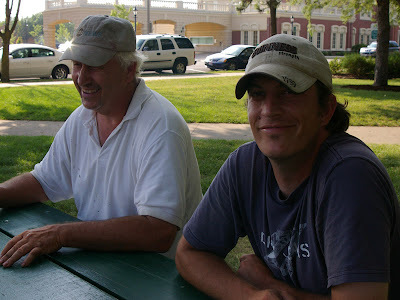 (See my June 12th and 24th posts.) All these photos are courtesy of Peggy, Ottawa Visitor’s Center. Click photos to enlarge. 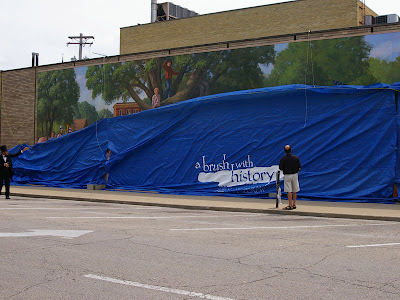 They covered up this mural with huge tarps (quite a job in itself) and then unveiled it on dedication day. A nice crowd showed up. 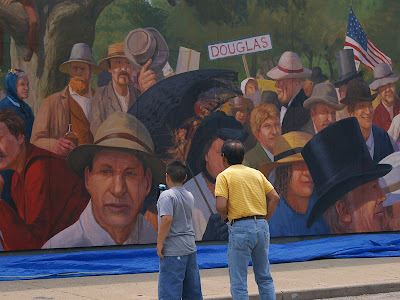 Even old Abe was there and got in on the act. 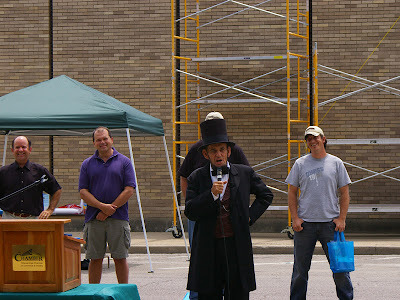 President Lincoln gamely tried out a new-fangled microphone. We shake hands with the fine folks of Ottawa. It was a challenging project but the support and encouragement of the community made it a lot of fun. What a huge, cool project. How wonderful to do something like that with your son - I bet you had a great time and made lots of memories. Thanks to both of you for the nice comments. 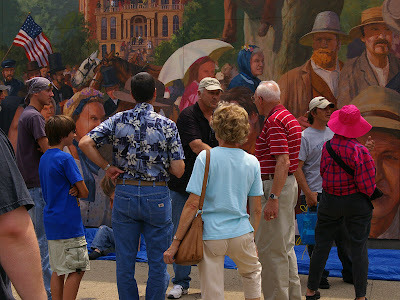 Yes, it was great to work with Jared again--it's been about 5 years since he's helped on a mural. We did have fun together. Hi Annette, good to hear from you. Glad Lola's enjoying her fame. We sure appreciated all your hospitality while we were there, and of course your generosity in loaning Lola for a model!